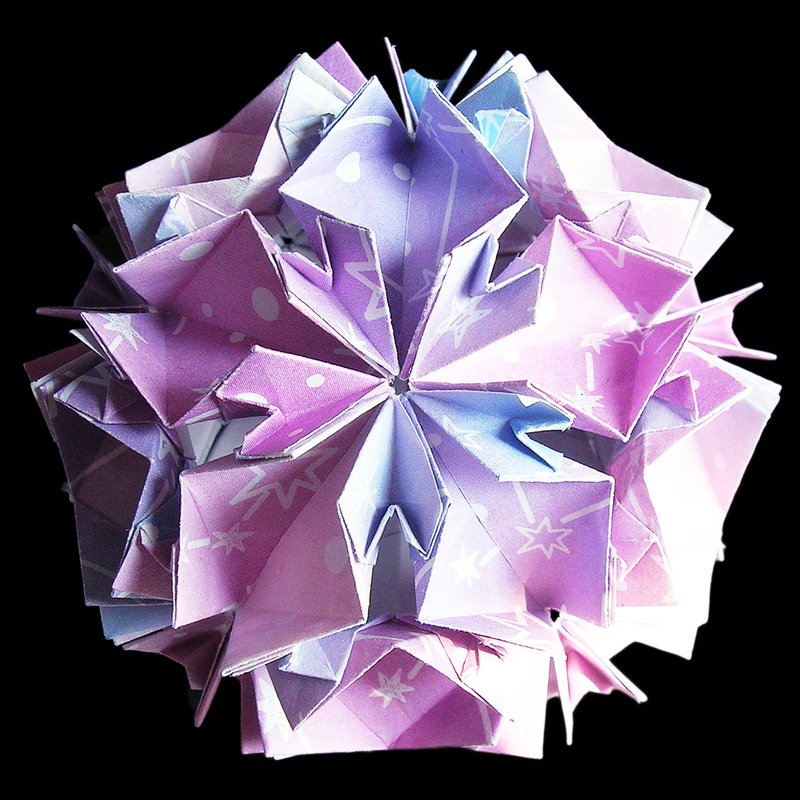 The works Kusudama-suites series are my challenging works that how to connect the parts which are made of easy bases. Works have been made since 2010 and the series continues increasing the number. The easy bases have roughly divided into two types: one is Kannon fold and the other is Zabuton fold. Kannon fold is the same as “gate fold” or “8-page gate” in English, I think. Kannon (観音) is one of Bodhisattva in Buddhism, called Guanyin or Kwannon in English. Guanyin statue is stored in a miniature shrine which is called “zushi” and has double-door mostly. This double door which is opened from the center is called Kannon-door (観音扉), opening the double door is Kannon-bilaki (観音開き) in Japanese. The name of Kannon folding comes from this double door. Does the name of Gate fold in English come from the same?? Zabuton fold is the same as Blintz-fold in English. Zabuton (座布団) means cushion in Japanese. 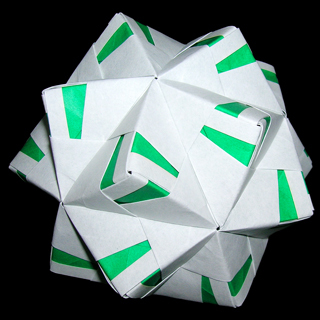 But I felt the name of Bintz-fold is fitter for this folding. 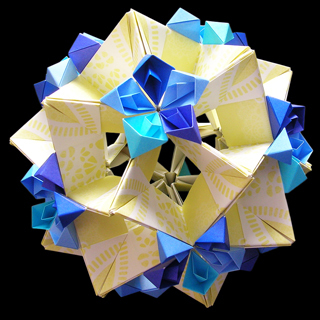 Names of Kusudama suites works were named after dances all over the world or musical terms. “suites” means a suite to be used in music. The name of this work “Furiant” comes from a Bohemian dance. There is a possibility that one work can have four completion forms: natural-type(♮), flat-type(♭), double-flat type(♭♭) and shape-type(♯), the names come from Accidental (music). 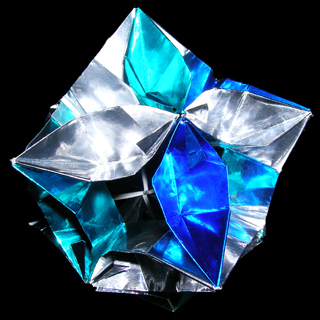 All of these works have only a few different foldings in the last processes and assembling methods are different. But I made only one form in a work most so far. 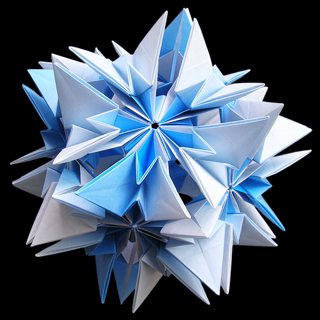 Friant is one of Kusudama suites work which was created in 2011, which I made one form as usual. 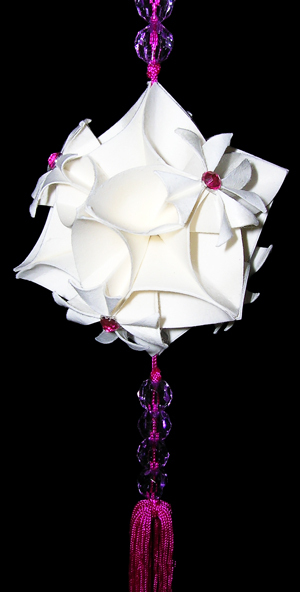 But this month, I created one more shape of this work and a variation work. 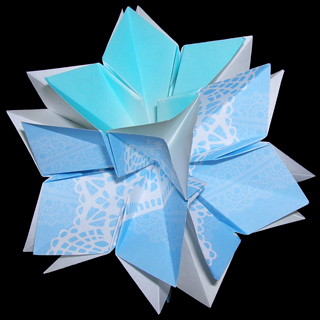 Assembling method is Flat-and-Pocket joint, one part has two flaps and pockets, each part can be connected by inserting a flap into a pocket like normal unit origami works. There are two characteristics in this work. The work can be decorated with 1/8 rectangle decoration parts since having 1/8 rectangle standard. I might create this one if I have time. The other characteristic is about the pocket. The pocket has a small hook to connect tightly. If the pocket doesn’t have this hook, it might happen easily that the inserted flap comes off. But it’s possible to join parts together without creating a hook in the pocket, would be easier than the way I took. And there is another way to connect parts, which using way of Arabesque joint. 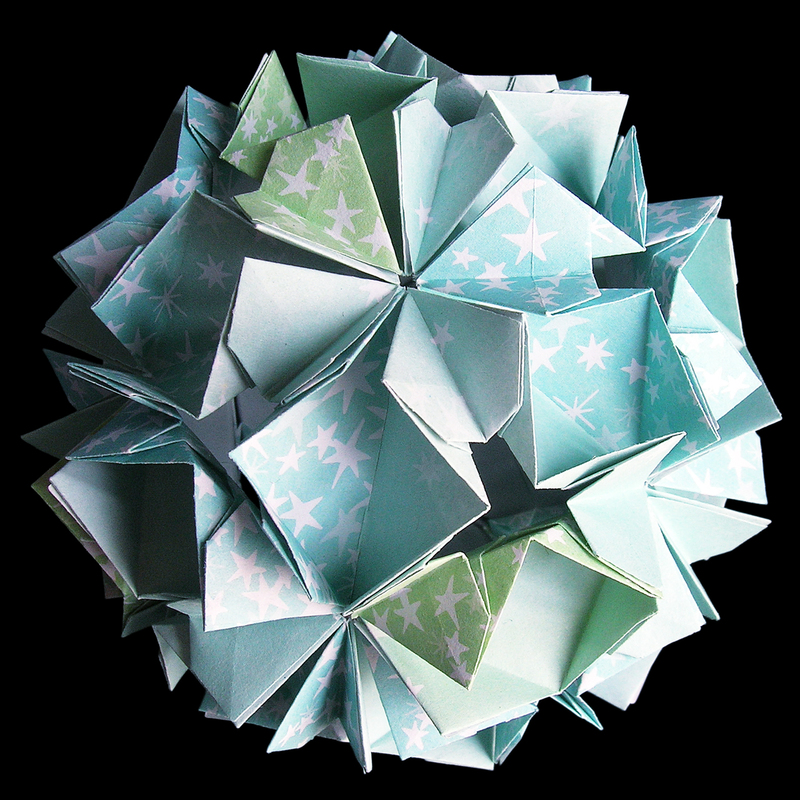 If the parts are assembled by this method, the finished form of this work becomes similar to Polka which is one of Kusudama suites work, I imagine. Also, it can be said that parts of Polka can be assembled by Flap-and-pocket joint used to this Furiant.